German Import- 2016 marks the 25th anniversary of the visionary debut „Dhyani“. 25 years PROJECT PITCHFORK, a quarter of a century of Dark Electro history! Before PROJECT PITCHFORK once again set sail for new horizons, Peter Spilles makes use of this welcome opportunity to enrich the world’s most extensive Dark Electro compilation with another chapter. Consequently entitled „Second Anthology“, also this next part is reviewing the unrivalled career of this legendary project. While „First Anthology“, released five years ago, highlighted and reanimated the harsh first steps, the iconic uprising and the justified successes up until the unforgettable tunes of „Timekiller“, Peter Spilles now begins where he left the field: in the year 2002. Back then, „Inferno“ was released, to this day an extraordinary release that had to compete rather unfairly with the previous mega seller „Daimonion“ – even though it highlighted an entirely different facet of their body of work. 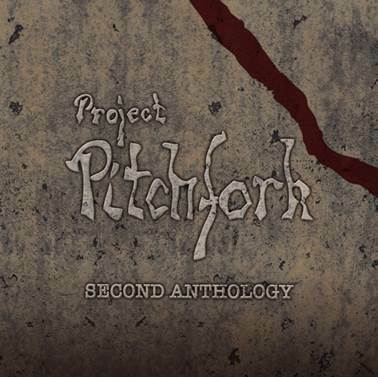 „Second Anthology“ accommodates the status of this special album by including four pieces that have been entirely re-recorded and resung in the studio. Yep, he’s serious about that. This ethos holds true for every single one of the 33 tracks on this brimful anthology. All the songs have been remastered and partly remixed. Once more, one cannot help but complimenting Peter Spilles: Whether it’s „The Future is Now“ or „Fleischverstärker“ off the opulent masterpiece „Kaskade“ (2005), more current smashers like „The Dividing Line“, now sung in duet with Sven Friedrich of THE DREADFUL SHADOWS fame, or the furious „Lament“ (taken from the 2011 opus „Quantum Mechanics“)… these tracks have been so carefully touched and edited as is only possible for someone whose heart is beating for this songs to this day. Special Edition, Limited to 2000 copies, same tracks as regular edition but coming in special opulent box-packaging (approx 18,5×18,5 cms) with 64 [!] pages extra booklet, booklet incl. an extensive picture gallery. All printed parts boast luxurious silk matte lamination!